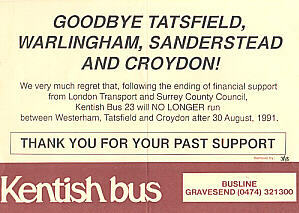 This limited service was part of The Surrey Sunday Leisure Bus operation and ran during the summer of 1994 between West Croydon, Selsdon, Sanderstead, Warlingham, Tatsfield and Westerham. The route was revised for 1995 as shown below. During the Summer of 1995 the Surrey Sunday Leisure service ran on Sundays and Bank Holiday Mondays to and from Sevenoaks, Tonbridge and beyond to Beltring Hop Farm.